When most people think of Morocco, the images that come to mind are those of endless desert landscapes or crowded colorful markets. Often overlooked, however, are the hiking opportunities offered by the country’s most famous mountain range, the Atlas. 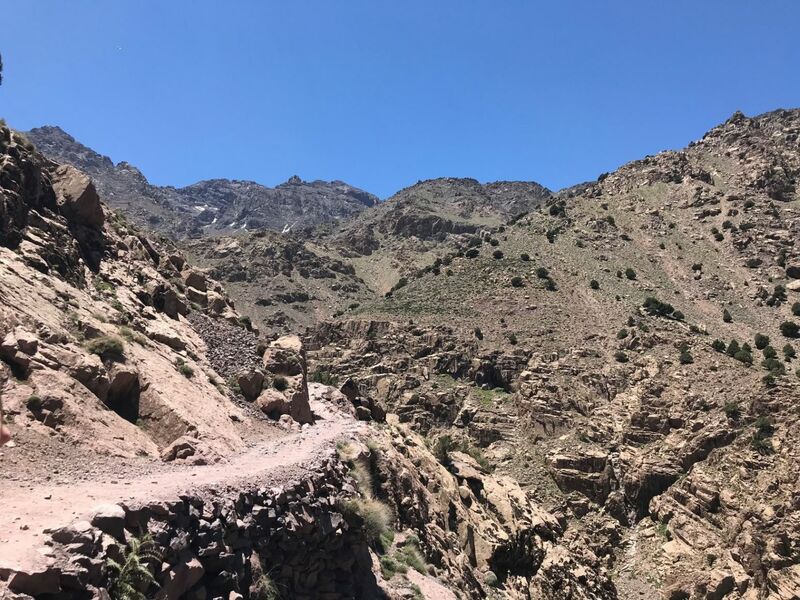 Located somewhere between the souks and the Sahara, the Atlas Mountains are home to Toubkal National Park and its namesake peak, Mount Toubkal, also known as Jebel Toubkal (jebel meaning mountain in Arabic). 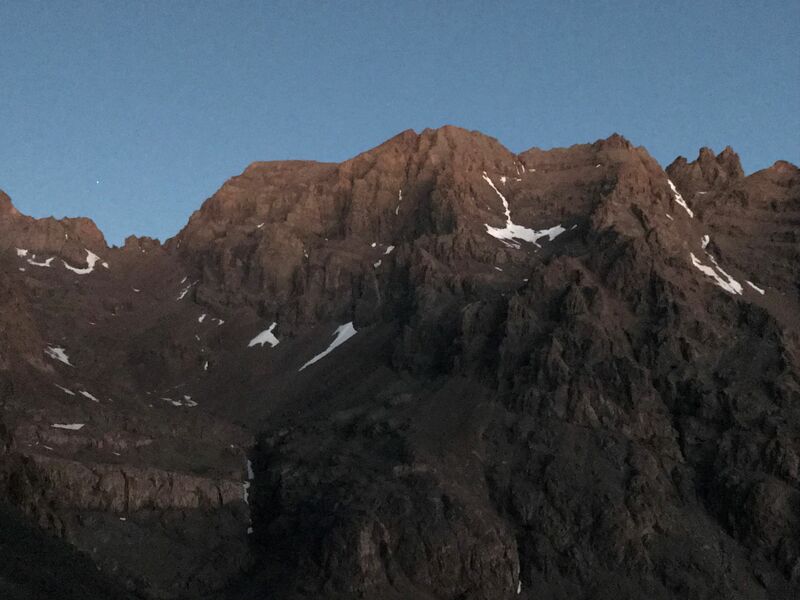 At 4,167 meters (13,671 feet), Mount Toubkal is the highest mountain not only in Morocco but in all North Africa. Reaching the summit is no easy feat, but it will allow you to see a different side of Morocco: the view from above. 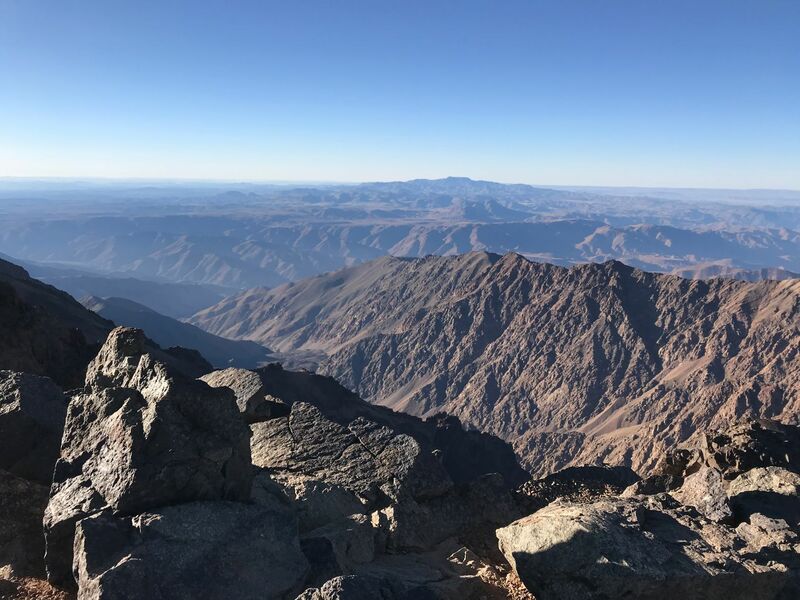 Standing on the country’s single highest peak, with a sea of mountains below you, you can spot tiny Marrakesh in the distance and be amazed at how far you’ve come. 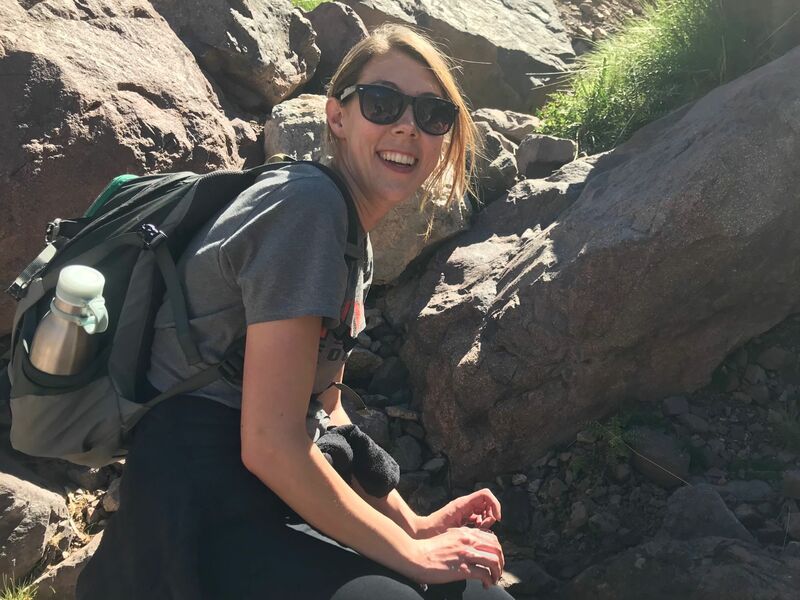 If you really want to experience everything Morocco has to offer, then hiking in the Atlas is a must. 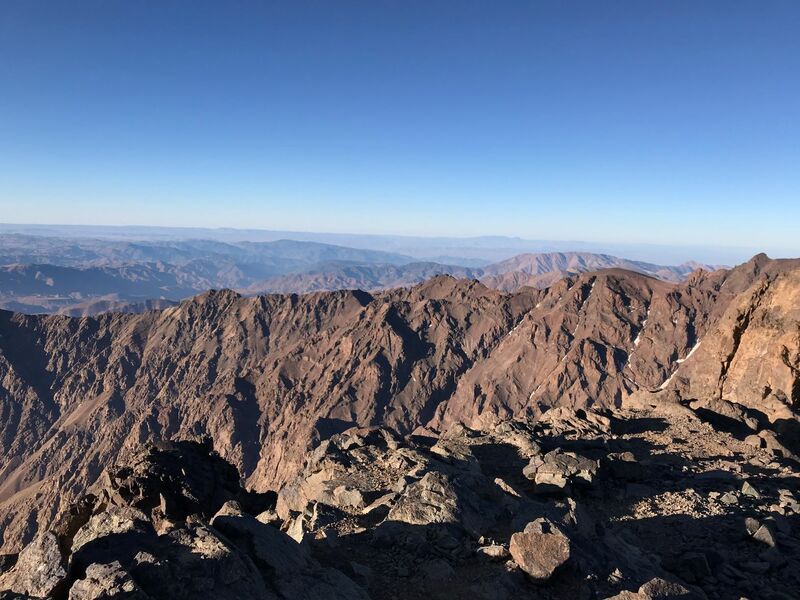 Whether you are a seasoned hiker seeking your next challenge, or simply find yourself yearning for a nature break from the chaos of Marrakesh, hiking to the summit of Toubkal will make your Moroccan adventure even more memorable. 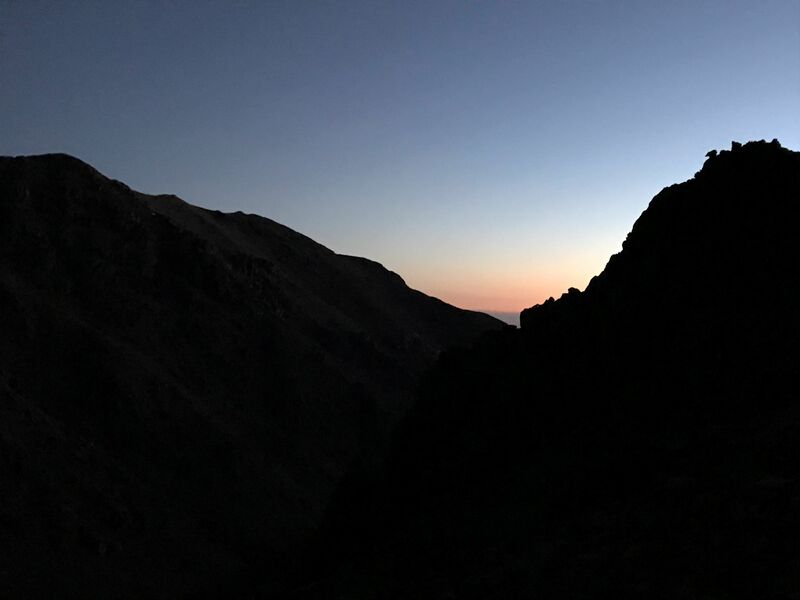 Here’s what you need to know before you embark on your journey to the top of Mount Toubkal. 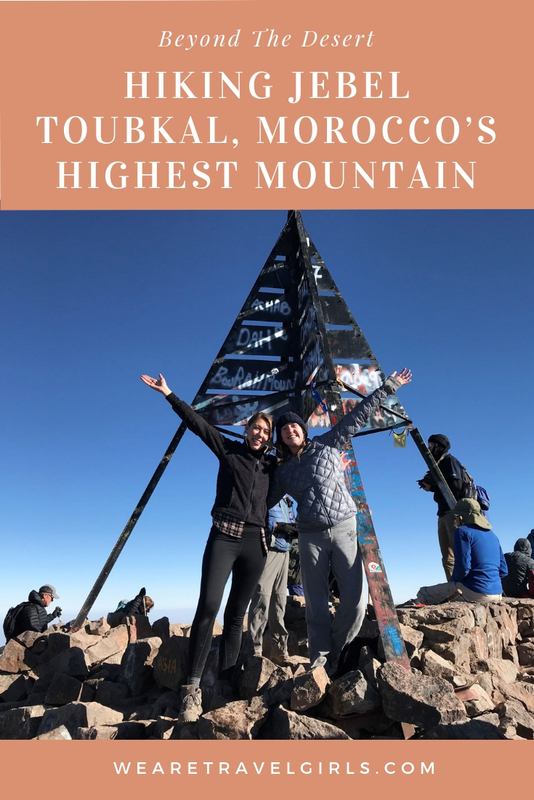 HOW LONG DOES IT TAKE TO HIKE MOUNT TOUBKAL? 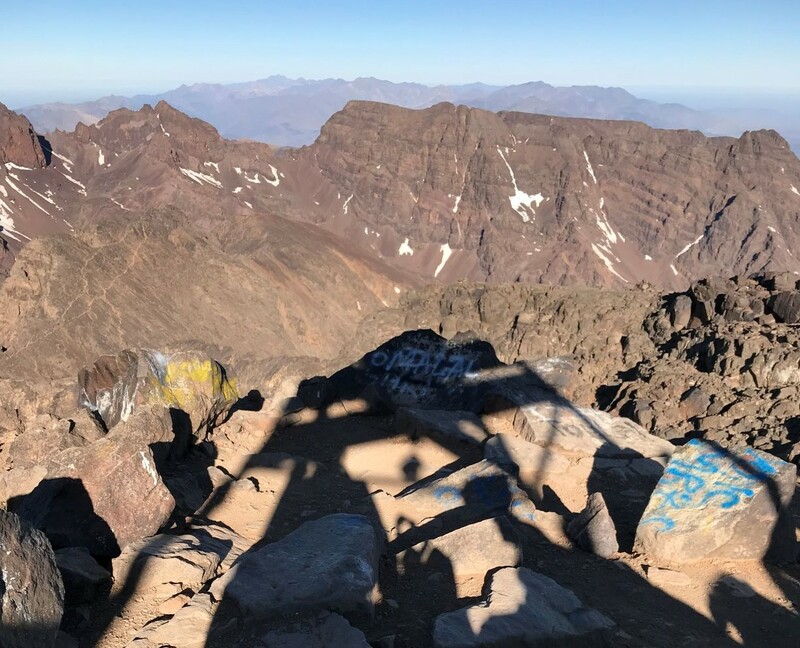 So, you are considering trekking to the summit of Mount Toubkal? Great! Your first question is probably some form of “Can I do this? !” and trust me, it’s a good one. You will need 2 full days to reach the summit and descend. On day one, you depart from the village of Imlil in the morning and hike about 5-6 hours to the refuge where you will spend the night. Then on day 2, you’ll wake up before sunrise to hike the 4 hours to the summit, then head back down to the refuge, and all the way back to Imlil. 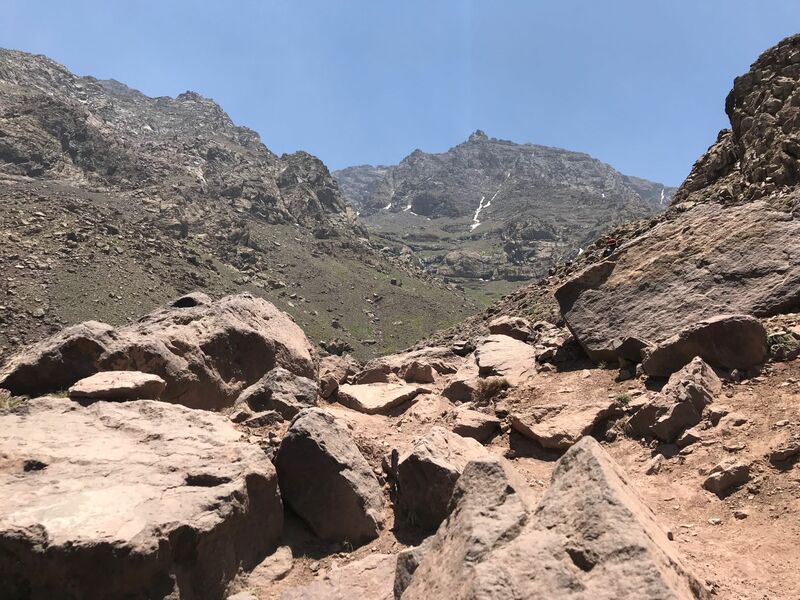 Reaching the summit of Toubkal is no easy feat: the hike is physically challenging, the changes in altitude are rapid, and parts of the trail are not well maintained. 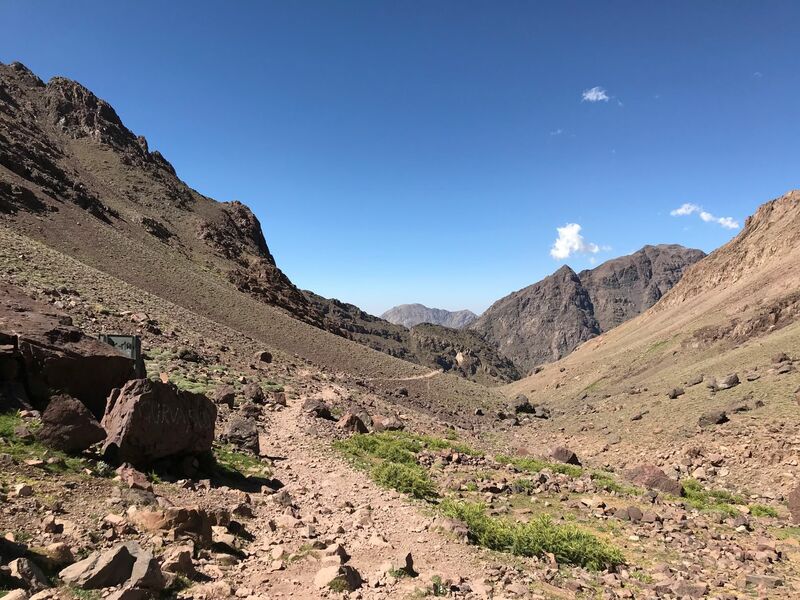 Nevertheless, I was able to complete the Toubkal trek despite being in only fairly good shape, and with zero training- unless you count meandering up and down the hills of Lisbon in search of vino verde the week before. The hike is difficult, but it is not impossible, even for an inexperienced hiker. 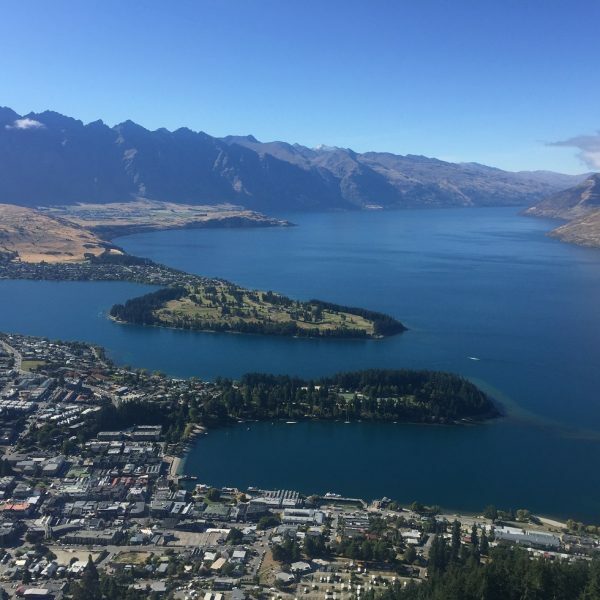 If you have a reasonable fitness level and more importantly, motivation, you can reach the summit and will be rewarded with stunning views and the experience of a lifetime. 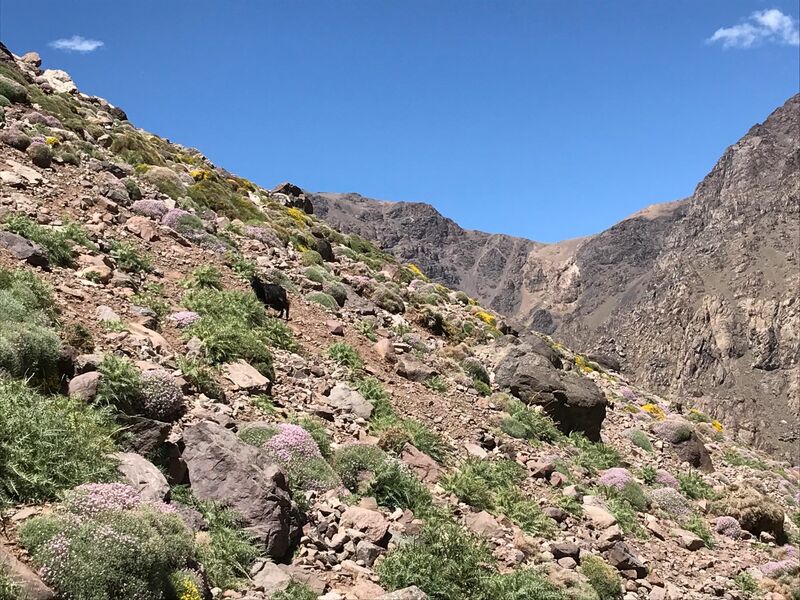 Hiking Mount Toubkal is best between late April and October, with May or June providing optimal weather. Daytime temperatures are pleasant, but not unbearably hot. Most of the snow should be melted- should being the operative word. Check conditions before you go to ensure the summit can be reached without any special snow gear. 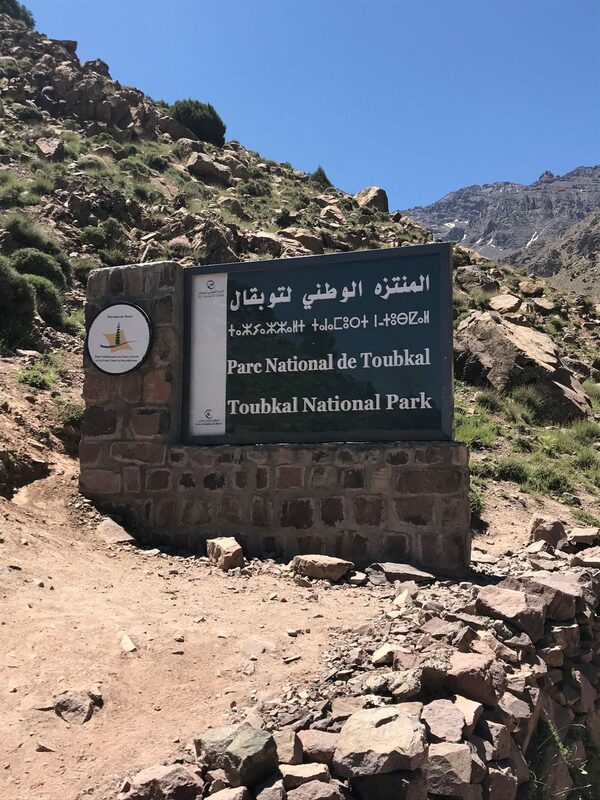 The trailhead to Mount Toubkal can be found in a small town called Imlil, roughly an hour outside of Marrakesh. 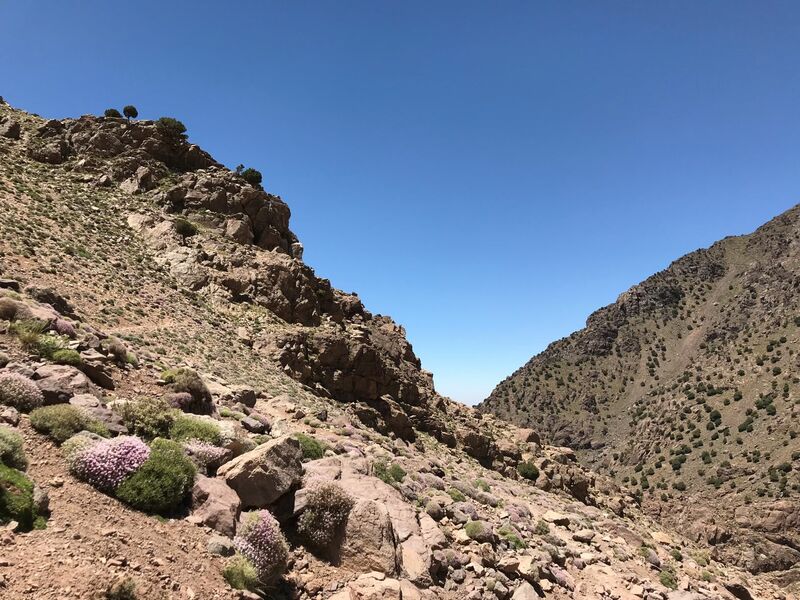 You can opt to book lodgings there for the nights before or after your hike, but many hikers (myself included) simply use Marrakesh as a base and hire transport to and from Imlil. If you go this route, the best way to organize the hike is through your hotel or hostel in Marrakesh. Moroccans are known for their hospitality and are always eager to help visitors see more of their country. Ismail at Majorelle Hostel– which I cannot recommend highly enough for your stay in Marrakesh- assisted me and my two hiking companions in hiring a guide. The complete package included roundtrip transport to Imlil, a guide for our trek, meals, and one night’s stay at the hiker refuge. The cost was 1300 MAD, or about $130 US. Most lodgings in Marrakesh will be able to arrange something similar. Ismail also helped us order pizza upon our return, but more on that later. DO YOU NEED A GUIDE FOR THE HIKE? 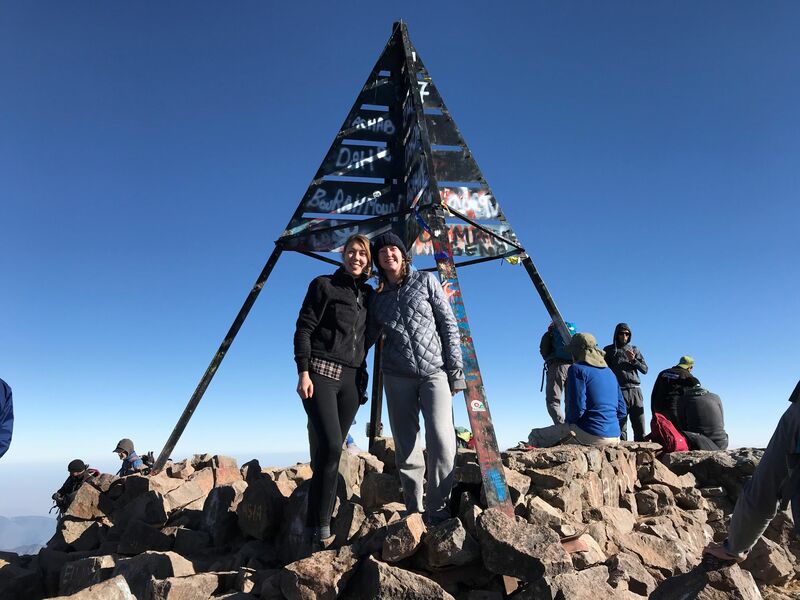 It is possible to reach the summit of Mount Toubkal without a guide. However, in my opinion, the benefits of having a guide far outweigh the costs. First and foremost, a guide will help you determine the easiest and safest path to take to the summit and back down. 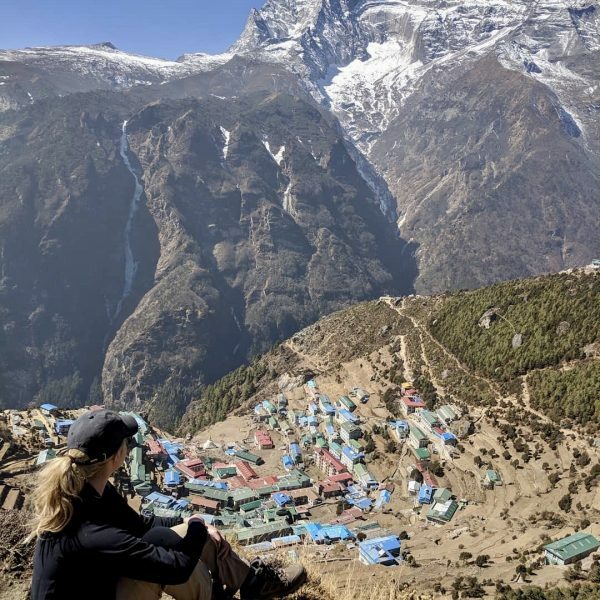 Guides are also valuable for their knowledge of the area’s history, connections to locals, and assistance in arranging logistics such as meals and lodging. For first time Atlas Mountain hikers who are anything less than highly-skilled, I recommend hiring a guide. A headlamp: put this at the top of your list, in red, underlined. When you begin your ascent to the summit at 5:00 am on the second day, surrounded by darkness, you will thank me. Good hiking shoes: The trail is very rocky and at times slippery. Near the summit, you will encounter cold temperatures and maybe even snow. I recommend wearing sturdy trail running shoes or hiking boots that can accommodate an extra pair of socks. Snacks and water: Your tour/guide will likely arrange for meals along the hike, and when you spend the night at the refuge, dinner and breakfast will be provided. However, it’s still a good idea to pack some snacks for extra energy and nourishment or to reward yourself at the summit. 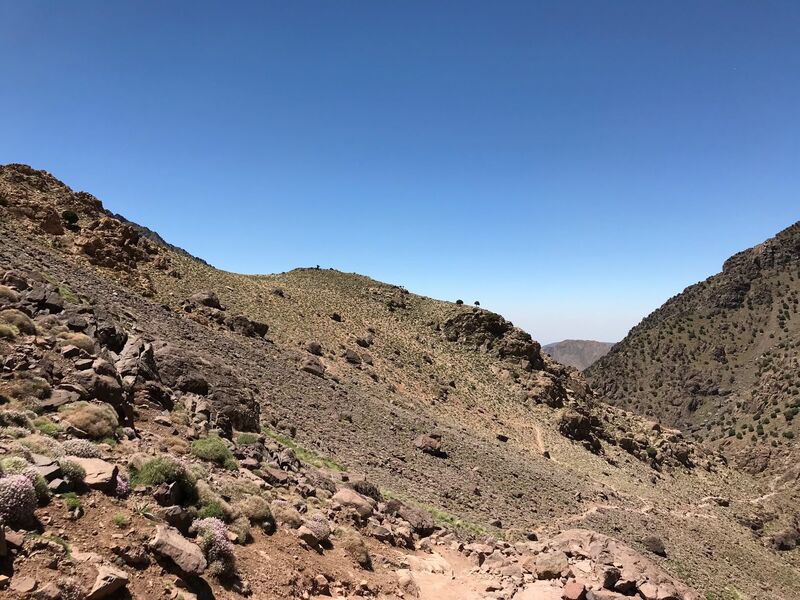 TIP: Because Morocco is a Muslim country, and mountain villages tend to be more conservative than big cities, I would advise keeping your shoulders and knees covered during the hike. You’ll want to depart Marrakesh for Imlil around 8 or 9 in the morning. It will take you about 5-6 hours to hike from Imlil to refuge where you will spend the night. It’s important to arrive at the refuge by late afternoon, not only to avoid hiking in the dark but so you have ample time to rest your muscles and adjust to the altitude. Therefore, make sure you set out early enough so that you can pace yourself on the hike and take breaks as needed. 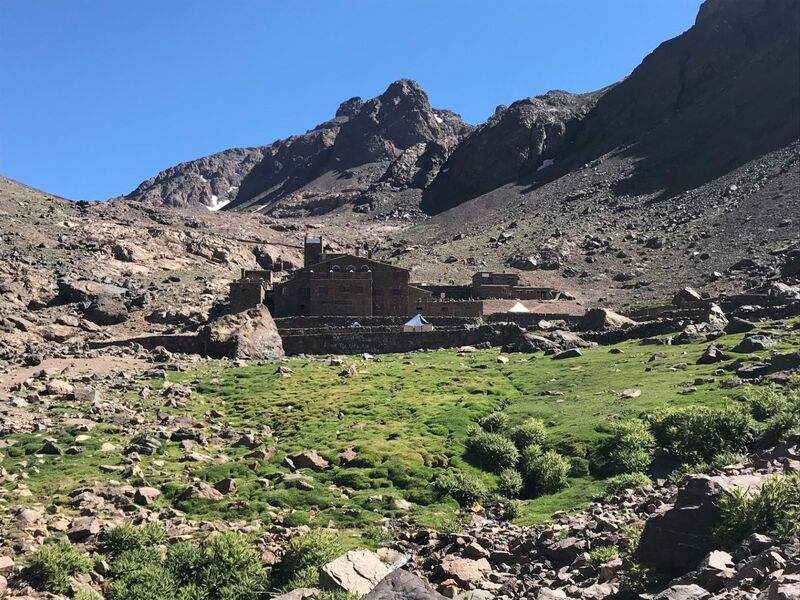 Upon arrival in Imlil, we met our guide, a soft-spoken young man named Marwan from a local Amazigh family, who had been hiking the Atlas Mountains from a young age. He told us that he first reached the Mount Toubkal summit at age 12! Many of the villages and families surrounding Marrakesh and the Atlas Mountains are of the Amazigh people, commonly known as “Berber”. Their language, along with Arabic, is an official language of Morocco. Although the name “berber” has become commonplace, it is often considered politically incorrect and even offensive. Amazigh is their self-given, historical name. It’s worth it to educate yourself on this distinction and use the proper term regardless of what you hear. Have breakfast before hitting the trail- you’ll need the nourishment and your next meal won’t be for a few hours. From the trailhead, you’ll make your way further and further from the village on a steady incline, eventually reaching the sign that indicates (in four languages!) that you are entering Toubkal National Park. Inside the park, the path becomes rockier and the incline gets steeper. There are a few small restaurants scattered throughout, which make ideal stops for lunch. Eventually, you will reach a gorgeous valley and will hike alongside it. As the altitude continues to increase, so does the difficulty of the hike. It is important to listen to your body and take water or rest break when needed. 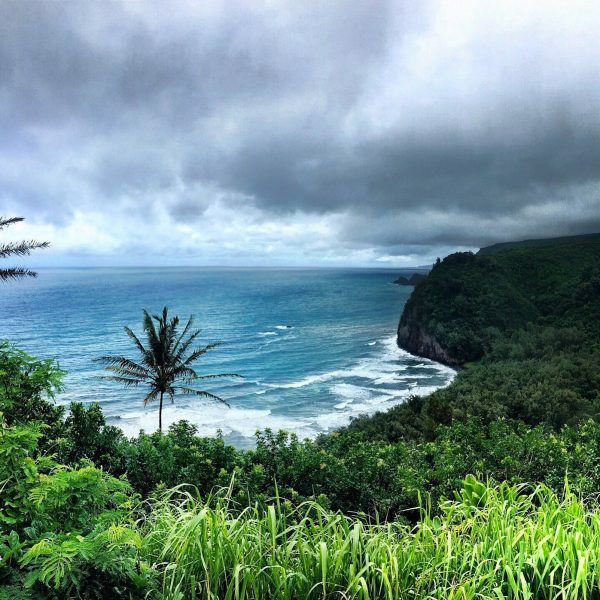 Besides, you’ll want to stop and admire the beautiful scenery and snap a few photos! In the summer, the slopes are covered in colorful wildflowers. We also stumbled on several herds of goats, including adorable babies! The mountain air is crisp and refreshing and the silence is a welcome retreat from the stress of traveling. Freshly melted snow produced beautiful waterfalls and streams. I took a few sips of stream water with no adverse reactions, but if you have a sensitive stomach, I would stick to bottled water. Around 5 pm, we reached our lodgings for the night. The CAF was comfortable and warm and provided what we needed for a one-night stay and nothing more. 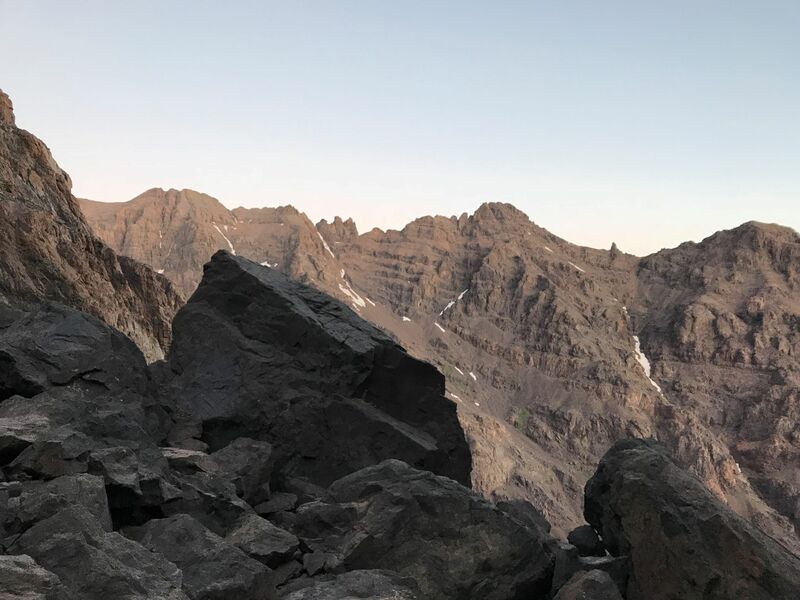 If you are hiking with a guide, they will probably take care of reservations, but if you complete the hike on your own, be sure to reserve your bunk ahead of time, especially during busy warmer months. Once at the refuge, take your boots off and enjoy the view around you. Swap stories and get advice from your fellow hikers. At the CAF, water and snacks can be purchased, and dinner (included in the nightly rate) is served in the evening. Expect a carb-heavy meal: we were served spaghetti, french fries, and chicken, all on the same plate. There are toilets and showers available, although long lines and cold temperatures make showering less than ideal. The refuge provides the bare minimum: a bunk, heavy blanket, and pillow. Get to bed early- you’ll have a wake-up time around 4:00 am, so you can be ready to head out by 5:00 am. Don’t assume you’ll sleep soundly though, as its nearly impossible with 20 other people in the room (or more!). I had the misfortune of being right next to a snorer, so I woke up the next morning less than well-rested, to say the least. There’s no need to set an alarm for your 4:00 wake-up; it’s likely that everyone else in your room will be fumbling around in the dark to get to breakfast before heading out. Breakfast is a simple affair of various bread, toppings, and tea, but you won’t want to eat or drink too much as nature is your only bathroom for the next several hours. When you step out of the refuge into the cool darkness, don’t forget to look up at a dazzling display of stars. Revel in its beauty, if only for a few moments, because the most difficult hours of the trek are just ahead of you. Hiking in the dark can be a bit jarring. This is the part of the hike where you absolutely need the headlamp that you packed after listening to my dire warnings earlier in this post. I did not have a headlamp, so in order to see where I was going, I had to climb using the light of my phone. It is extremely inconvenient (and probably a little dangerous) to have to use one of your hands to hold a phone during this part of the hike. So, learn from my mistake, do yourself a favor, and bring a headlamp. From the moment you depart the refuge, the final ascent to the summit is fast, steep, and physically challenging. Hike at a slow but steady pace to avoid altitude sickness. Much of the trail up at this point is scree, a word I did not know before I did this hike, and I must say, I am not a fan. We encountered a bit of snow, even though it was June, but nothing that stood in our way. Once you get past the scree, the path to the top becomes more well-defined. It is still quite strenuous, mainly due to the altitude, so take short breaks as needed. Eventually, the summit will come into sight in the form of a teeny, tiny triangle in the distance. There is a small plateau near the spot where you can first glimpse the metal summit marker which is great for one last rest before your final push. The views from here are worth snapping a few photos. For me, once the summit was in sight, my motivation was renewed. As you get closer to the top, hikers on their way down will offer words of encouragement. When I turned a corner and the summit was about 50 meters away, I teared up. Seriously. 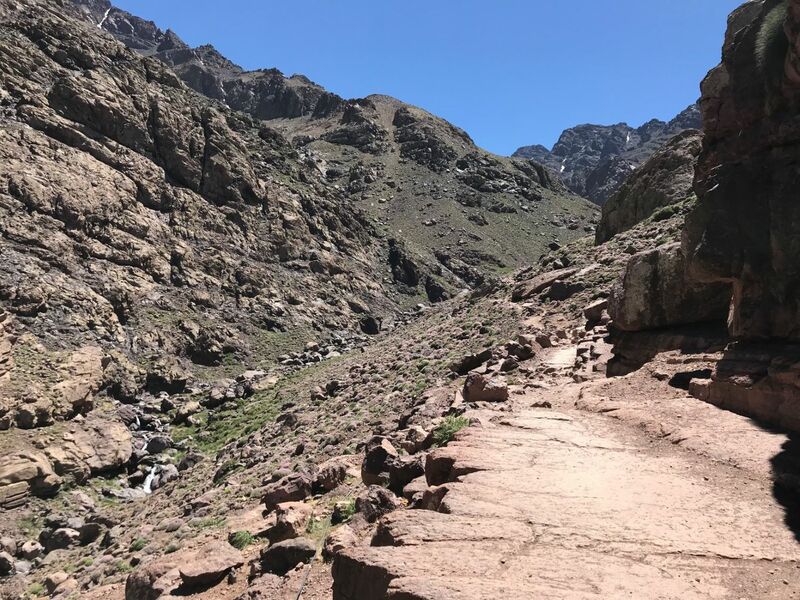 The hike from the refuge to the Toubkal summit takes around 4 hours, depending on your pace. At the top, catch your breath, rest your muscles, have a snack, and of course, get the perfect mountain top photo. You’ll need your strength because the trek down can be almost as difficult as the way up. While going downhill, it can be very difficult to stay balanced. Marwan was instrumental in helping us choose the path of least resistance, but I still struggled. I had such a hard time keeping my balance that at one point, my hiking companion Brooke refused to walk in front of me because she feared I would fall, and we would go tumbling down the slope together. My solution was to go low and slow, at times nearly doing a crabwalk. Hey, whatever works, right? The hike back down to the refuge takes about 2 hours. At this point, the most difficult part of the hike is behind you. While at the refuge, grab a snack and rest your feet a bit, then continue on back to Imlil. The route back to town was the same as the one we took the previous day on our way up, but it felt a lot different with the climb behind us, knowing we’d be back in our hostel bed in Marrakesh later that night. You’ll see hikers on their way up, full of apprehension and excitement, with no idea of the trials and eventually, euphoria, that await them. You may opt to spend the night in Imlil, or you can arrange to have your ride waiting to take you back to Marrakesh. When you’re back at your hotel, treat yourself to a Moroccan feast, or do what we did and order Pizza Hut (they will deliver into the medina if you’re wondering). Then spend the next few days lounging by the pool at a riad, or better yet, hop on a bus to Essaouira and relax on the beach. You deserve it. 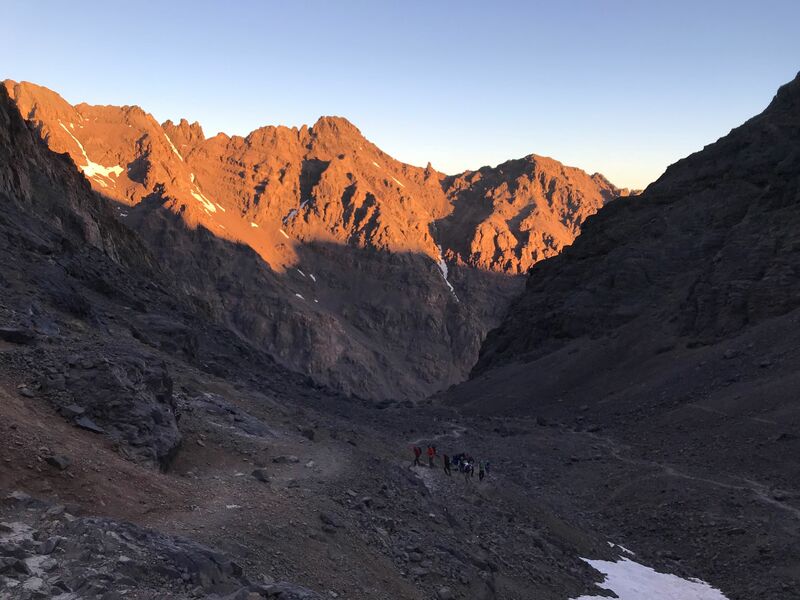 We hope that this article has helped inspire you to go hike Mount Toubkal, Morocco. If you have any questions about the destination or have your own travel tips to share please leave these in the comments below.